From four-year old’s to 70 year old’s, over 200 of Melbourne’s community joined ASRC’s Info Night: election campaign launch to Change the Policy on asylum. The first half of the evening focused on speakers with diverse expertise and stories from the ASRC, including CEO Kon Karapanagiotidis, Director of Advocacy and Campaigns Jana favero, Volunteer Manager Peter Callendar, Organising Manager Bella Weeks, Campaigns Manager Marcella Brassett, Organiser Ahmad Hakim and advocate Akuol Garang. High impact advocacy where a group of activists will hit the streets and mobilise the community to call and write to election candidates in that electorate on the spot. This will ensure we flood political leaders’ offices with messages to Change the Policy for people seeking asylum. Our key policy ask for candidates is to restore life saving SRSS (support services) for all people seeking asylum waiting for asylum applications. When: 13th of April and 11th of May 10am-3pm. To receive and share powerful stories to amplify voices of people from migrant and refugee background on what they are voting for or asking for this election. 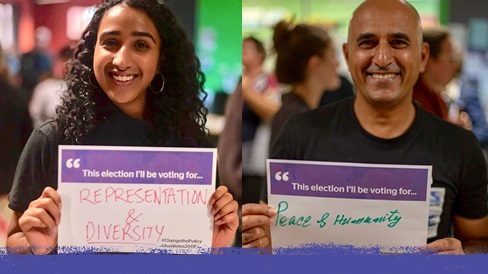 I’m voting for values – people took photos for social media holding up a sign with the values they are voting for this election, for example diversity, compassion, human rights and so on. This campaign will continue and focus on activists from refugee and migrant backgrounds. Content will be posted on ASRC social media and via the Whatsapp Tree. We are also asking people to email their MP to commit to policy changes to support a permanent, safe home for people seeking asylum. People took photos for social media holding up a sign with the values they are voting for this election, for example diversity, compassion, human rights and so on. This campaign will continue and focus on activists from refugee and migrant backgrounds. Content will be posted on ASRC social media and via the Whatsapp Tree. Founder and CEO of the ASRC, Kon Karapanagiotidis, greeted our audience, including members of the Hazara, South Sudanese and Pakistani communities and 2016 Australian of the Year, Gary Lee, with a message of radical empathy. The threat isn’t in the mosque, and it’s not at our shores. It’s coming from the language of our elected political leaders that dehumanises people of colour, said Kon. ASRC’s campaigns and organising team laid out what these actions involved. We need thousands and thousands of people in the marginal electorates to talk to their candidates, said Bella Week, Organising Manager. “This means signing up to join stop and dials to ensure voters in these electorates phone their local candidates or write them a letter. “It means creating a powerful social media movement to shift attitudes and narratives with the I’m voting for values and the Whattsapp Tree to amplify the voices of people from refugee and migrant backgrounds in the election. It didn’t take long before dozens had signed onto Whatsapp groups, stop and dial actions, and close to the entire room taking photos with signs saying “I’m voting for” the core values driving their vote this election. Organiser Ahmad Hakim and advocate Akuol Garang closed the evening with moving, powerful calls to action to support communities from refugee backgrounds this election, with Akuol saying: “ We need to change people’s minds” about people seeking asylum who arrived by sea. Our community activists left ready to campaign for the election with a strong commitment to radical empathy and low tolerance for division. It’s exciting to see people put their values into action to change the policy on asylum and build a powerful community movement.